The Afterglow Vegan Blush Brush is best used with our Afterglow Infused Mineral Blush and Infused Glow Bronzer. Our Vegan Blush Brush is extremely soft and ideal for applying both loose and pressed mineral makeup evenly, to quickly create a gorgeous finish. We carefully select each handmade, super soft brush to be durable. Each brush is built with the right amount of bristles for optimal application of a specific product. 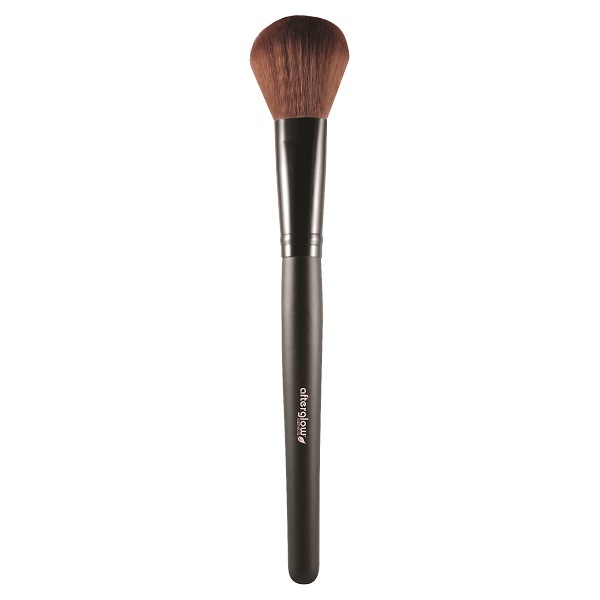 Swirl your Vegan Blush Brush into the blush or bronzer powder to pick up the pigment. Sweep the color onto your cheeks if you are applying blush or onto your cheeks, nose, and forehead if applying bronzer. Easily clean all of your vegan cosmetic brushes quickly with our Lavender Brush Cleanser spray or, for a deeper clean, wash them with a gentle shampoo or soap. Dirty cosmetic brushes can harbor bacteria. Washing your vegan cosmetic brushes is critical to ensuring bacteria-free brushes and healthy skin! Lay the brushes flat on a clean towel or with the brush bristles facing down to dry. Do not dry wet brushes with the bristles facing up as the moisture from the bristles will move down the ferrule (the metal connection with the handle) and weaken (or rot) the handle and the brush bristle ties.